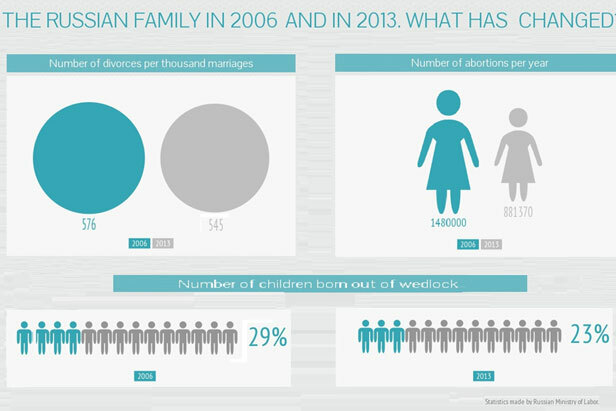 The Russian family in 2006 and in 2013: What has changed? Most Russians assert that they strive towards a healthy, close-knit family and marriage for life. However, sociologists point to research indicating that in reality, Russia's citizenry behaves otherwise, engaging in infidelity, divorce, and homosexuality. In early June, the Russian government presented a report entitled “Conception of State Family Policy for the Period up to 2025”. The document pointed to the crisis in the Russian family in the late 1990s and early 2000s, citing the effects of low fertility rates, the prevalence of divorce, and the weakness of family ties. The government's new policy seeks to remedy this situation.